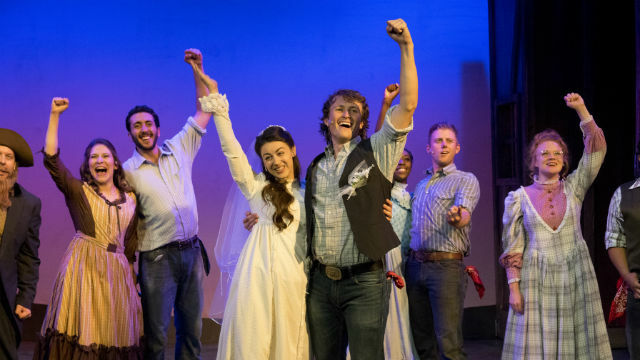 A scene from “Oklahoma” at New Village Arts in Carlsbad. When it first opened in 1943, “Oklahoma” was a ground-breaker: a “book musical” that integrated the songs and dances into a serious story that was about more than froth and humor. A 15-minute dream ballet (famously choreographed by Agnes DeMille) clinched its uniqueness. This first collaboration between Richard Rodgers and Oscar Hammerstein II earned the prolific duo a special Pulitzer Prize in 1944. These days, it has the scent of must and corn. But it’s still a great show. And it can be whipped into new heights of humor. New Village Arts gives it a fresh spin, with a small cast, minimal musical accompaniment (Tony Houck works overtime on piano backstage, with spunky onstage additions from dancing/singing fiddler Morgan Carberry; the occasional drumming sounds cheesy). The 14-member ensemble is energetic, and the singing is strong. The dancing, not so much, and choreographer Julio Catano would have done better to do less. But the cast is game, and they give it their best. This is especially true of Zachary Scot Wolfe, who’s delightful as the good-hearted dim-bulb, Will Parker, and makes a nifty pairing with irresistible, deliciously flirtatious Alexandra Slade as Ado Annie (the infamous girl who “Cain’t Say No”). When he dances with Kelly Derouin (the chortling Gertie), with whom he was terrifically teamed last year in “The 1940s Radio Hour” (to be reprised this holiday season), hoofin’ sparks really fly. The central romance, of course, is between the pseudo-reluctant lovers Curly and Laurey. Adorable Jack French is pitch-perfect in his swagger, bravado, sarcasm and smooth, effortless baritone. Charlene Koepf shows off her wide-ranging voice as Laurey, though she plays dismay, consternation and fear more credibly than joy. But their connection is believable and enjoyable. Susan E.V. Boland has played Aunt Eller a number of times, and she’s got it down to a T (or would that be an O? )… the hardscrabble matriarch of the Oklahoma Territory… at least in Rogers County in 1906, on the cusp of the area’s statehood. Rich-voiced, imposing Equity actor Christopher Lesson is duly frightening and formidable as the loner hired hand, Jud Fry. In a nicely layered performance, he even engenders a bit of sympathy for Jud’s reclusive, undervalued life. Jonathan Sangster is a delight as Ali Hakim, the supposed Persian peddler (here, he really hails from New York). He milks a ton of laughs from the huckster who woos the ladies and repeatedly winds up on the wrong end of a shotgun from angry fathers, including Ado Annie’s no-nonsense Dad, convincingly played (looking a bit like an outcast from “Duck Dynasty”) by Devin Collins. The only misstep here would seem to be the Dream Sequence (mercifully not called a ballet, which it decidedly isn’t). It goes on too long, and adds in extraneous elements like a can-can segment (huh?). With so few dancers on baord, a brief retelling of Laurey’s nightmare would undoubtedly be best. But they get an A for effort. Making his West Coast directing debut (he has an MFA in Directing from the University of Memphis), Teddy Eck captures the can-do pioneer spirit and patriotic pride of early Americans, including the diversity of the population (which is true to the times). Performances are Thursday-Saturday at 8 p.m., Saturday at 3 p.m., Sunday at 2 p.m.